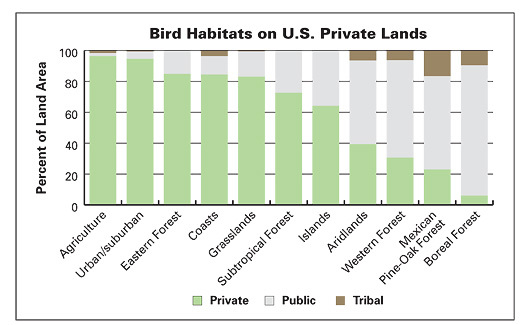 The State of the Birds 2013: Report on Private Lands in the U.S. Yesterday afternoon the 2013 U.S. State of the Birds Report was released, the nation’s first review of bird distribution and conservation opportunities on private lands. This collaborative effort of the North American Bird Conservation Initiative included partners from across the country and highlights the enormous contributions private landowners make to bird and habitat conservation. In the report you can read about endangered species whose populations are supported almost entirely by private lands, such as the Golden-cheeked Warbler of central Texas. You’ll also learn about innovative win-win solutions for working lands, like the conservation easement on 14,000 acres of shortgrass prairie on the Wineiger-Davis Ranch in Colorado, which both helps sustain the family’s livelihood and also supports Mountain Plover populations. Private landowners, including two million ranchers and farmers and about 10 million woodland owners, own and manage 1.43 billion acres, roughly 60% of the land area of the United States. Private lands are used by virtually all of the terrestrial and coastal birds of the U.S., 251 of which are federally threatened, endangered or of conservation concern. Many privately owned working lands that produce food, timber, and other resources for society also provide valuable habitat for birds. The scientific data show a very high dependence on private lands among grassland, wetland, and eastern forest birds, as well as the tremendous potential for bird conservation. Half of the more than 200 bird species analyzed in this report have 50% or more of their distributions on private lands in the U.S.
Privately-owned wetlands support more than 75% of the breeding and wintering distributions of waterfowl such as American Black Duck, Blue-winged Teal, Northern Pintail, and Wood Duck. Coastal areas constitute only 9% of the total land area of the U.S. (excluding Alaska and Caribbean and Pacific Islands), but 25% of all bird species in North America use coastal habitats for some part of their annual cycle. Hawai`i accounts for approximately 0.2% of the area of the U.S., yet it contains 33% of all federally endangered bird species. Seven breeding obligate grassland bird species, including Eastern Meadowlark and Dickcissel, have more than 90% of their distribution on private lands. With 97% of their distribution on private lands, Eastern Meadowlarks depend on the grassland habitat provided by pastures and farm fields. Six other obligate grassland breeding bird species also have distributions greater than 90% on private lands. Eastern Meadowlark by Joshua Clark, www.momentsinature.com. The report highlights success stories of the real and meaningful conservation impacts that the actions of voluntary private landowners can have on birds and their habitats. Through the Farm Bill’s Working Lands for Wildlife Program, more than 700 ranchers in eleven western states are enhancing 2.5 million acres of aridlands habitat for the benefit of sage-grouse. The Machias River Project in Maine protected 60,000 acres via purchase and easements, completing a mega block of contiguous habitat for 28 bird species of conservation concern, including Canada Warbler. Nearly 250 private landowners in Nebraska and Colorado have protected more than 1,000 nests of the imperiled Mountain Plover as part of the Prairie Partners Mountain Plover Nest Conservation Program. Following the Deepwater Horizon oil spill in 2012, landowners in 8 southeastern states voluntarily enrolled more than 470,000 acres in Farm Bill conservation programs as part of the Migratory Bird Habitat Initiative, providing habitat for wading birds, shorebirds, and waterfowl. The report’s take-home message is this: both birds and people rely on private lands, and that reliance is only going to increase as populations grow and our demand for things like food, timber, and energy increase. In order to support these growing needs, we must develop and support the continued use of creative strategies, programs, and partnerships for working landscapes that support not only the people whose livelihoods rely on them, but also the conservation of bird populations. maps, supported by eBird data. Jennie Duberstein has lived in southeastern Arizona since 2001, where she coordinates the Sonoran Joint Venture, a U.S. Fish and Wildlife Service program that works to conserve the unique birds and habitats of the southwestern United States and northwestern Mexico. She is the ABA's Young Birder Liaison, managing The Eyrie (the ABA’s young birder blog) and ABA Young Birders Facebook page and providing support to other young birder programs. She has worked with young birders through the ABA and other organizations since the late 1990s, directing summer camps, leading field courses, organizing conferences, and editing young birder publications. Jennie directs the ABA's Camp Colorado, co-leads VENT's Camp Chiricahua, and is a proud member of the Leica Birding Team.